How many times have you sent an email to the same group of people and say to yourself, why don't I just create a group for these people. Things happen, you get distracted, and you forget. 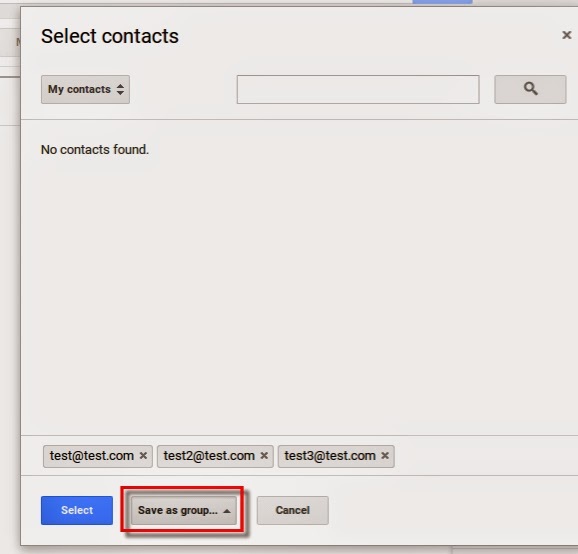 Did you know that you can create a contact group without even going into your contacts? It simple, just compose your email as you usually do and enter all the addresses in the to: field. Then click on the TO in the address bar to see a popup window that allows you to select more recipients from your contact list. At the bottom of this popup window you will see a button that says Save as Group. Click on that button, enter the name of the group and click save. You can then see your new group on the Contacts page (as seen in the third image). A couple of items to be aware of. 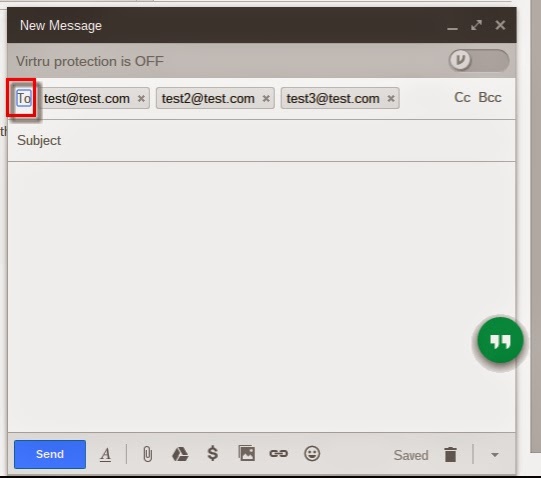 This feature works for TO, CC, and BCC separately. What that means is if you enter names in both TO and CC, but click on the work TO in order to save the contacts as a group, it will only save those entered in the TO field. In a similar fashion, if you enter names in the CC or BCC field and click on the respective button, it will only create a group with the names in that field. In addition, just because you create a group from the CC field, does not mean the next time you use the group the addresses will go in the CC field. You will still need to enter the Group name in the appropriate field you want the contacts in. It should also be noted that this option does not exist in Inbox by Gmail at this time. Clicking on the TO, CC, or BCC results in nothing happening. Hope this helps you be a little more efficient in your day. I have problem in creating New Name into my address book. It usually works but sometimes after inputting the email address into the CONTACT person, only the name appear but the email address remain blank. I did it over and over again but it did not work. Would much appreciate your help. Thanks! same here. I'm doing this because I do the prayer chain for a church, and Gmail is now labelling me a spammer because I send out a large batch of bcc emails. Now I can't send a group either! What gives! Do I have to go to Yahoo? HELP PLEASE....how do I add a name to an already existing email group? Thank you. Thank you so much Scott for sharing. I'm going to check out your site and see what other clever time savers you have. Yes, I'm getting error "unable to create group" as well. Trying with 98 email addresses. Tried simplifying group name to eliminate spaces and special characters, and still no luck. Same thing, won't let me save as a group. And I have no idea what an "incognito window" is! having the same issue folks anyone got a solution yet. I'm having the same problem and also tried using the "incognito" window and it still didn't work. Same thing. Even tried "incognito" window, but it didn't work. If this tutorial isn't working anymore, would you please note that above? I have been very frustrated trying to make this work and now I see that it does not. Same. "Unable to Save Group". It appears that it works for some users but not others. I can do just fine however another employee here cannot. Odd. Browser is controlled and updated by policy in our domain so they are the same version. Still doesn't work ! Why did gmail change to way contact lists could be created / maintained direct from menu options ? ? ? The industry needs to adopt the "IF IT AIN'T BROKE, DON'T FIX IT !" techniquie into its tool set.